I’m excited to teach you guys my favorite technique for how to paint furniture with chalk paint. This technique is super simple! 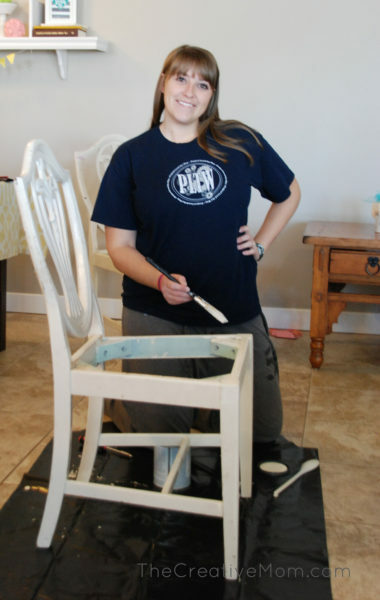 I promise to walk you through my tried and true step by step tutorial for refinishing furniture And along the way, I’ll share all my tips and tricks and all the products I use and love when I paint furniture with chalk paint. I go these antique chairs from my great aunt and I knew I wanted to paint them to freshen them up and give them new life again. It’s no secret that I absolutely love the way they turned out! If you want to refinish a piece, this is the way to do it! I love the results I get when I paint furniture with chalk paint. The number one question I get when people ask me about refinishing furniture is what paint to use when you want to paint furniture. 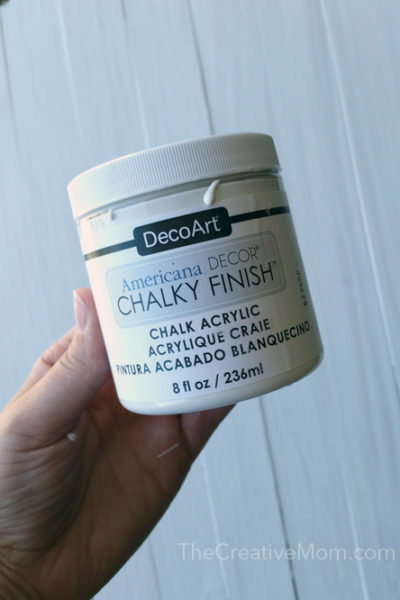 I pretty much always use DecoArt’s Americana Chalky Paint. It is FANTASTIC, people! This is chalk paint- not to be confused with chalkBOARD paint. You won’t be able to write on this with chalk, but rather, it has a really thick, chalk-like consistency. Here are some reasons I’m IN LOVE with this paint, and why it’s the only product I use to paint furniture. No prepping. 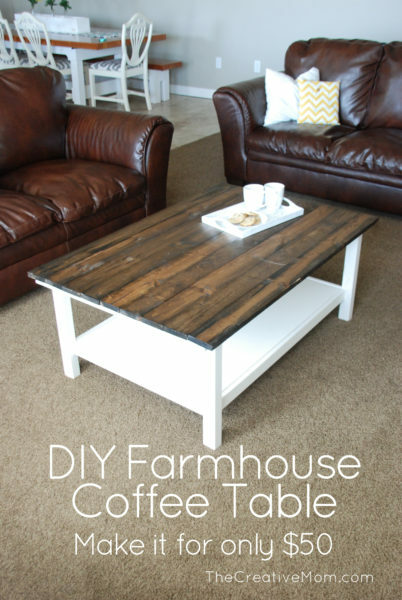 You don’t have to sand your furniture down or use a primer first. 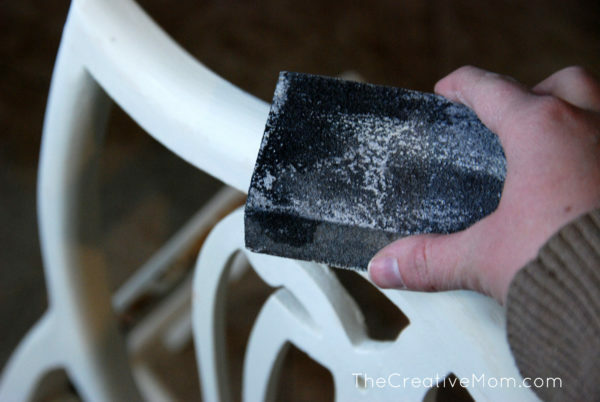 The only prep work you need to do on your furniture is making sure it’s clean- I simply wipe it down to get off any grease, dust, or dirt. You can use this paint on more than just furniture and wood. 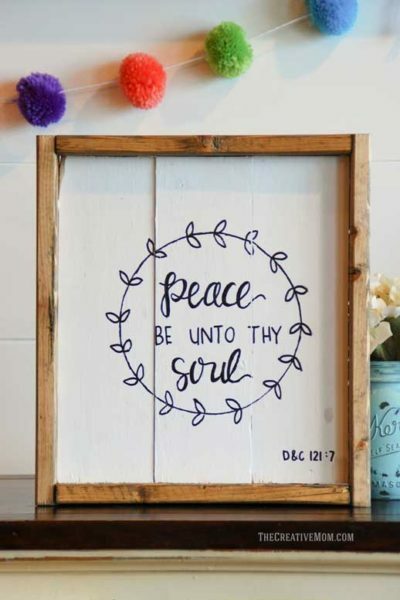 You can paint glass, metal, fabric, pretty much anything with chalk paint. I have painted mason jars with this paint, and it turns out SO cute! These jars by The Crafted Sparrow were my inspiration! No special finish required. 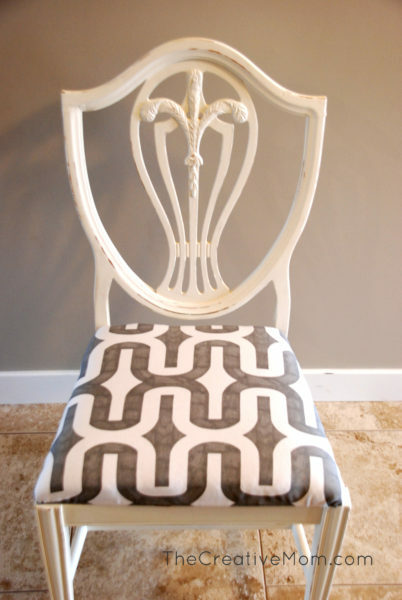 I love that after you paint your chair (or whatever), you don’t have to use any special lacquer or finishing spray. There is a wax you can use after you’re done painting. The wax is designed to protect the paint from chipping or scratching, but I’ve found that my paint is super durable without it. The only time I use the wax is if I know the piece of furniture is going to get a lot of wear and tear and heavy usage. For instance, a table top would probably need some wax. If your furniture is going to be handled a lot, you might want to use some wax. 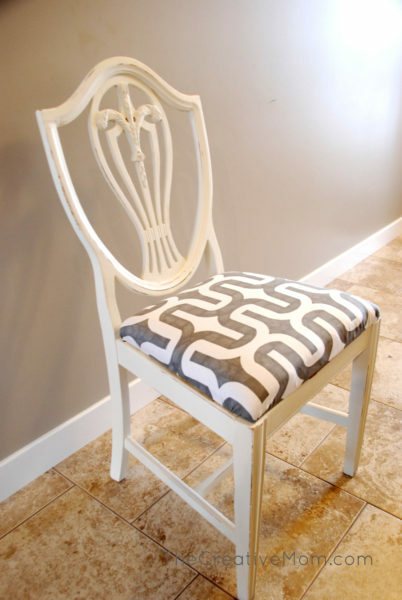 I did a little test when I first used this chalk paint on some other chairs 3 years ago. I finished one with only chalk paint, and I added wax to one chair and they are both still holding up, and I still can’t tell which chair has wax and which doesn’t. No odor and easy cleanup. 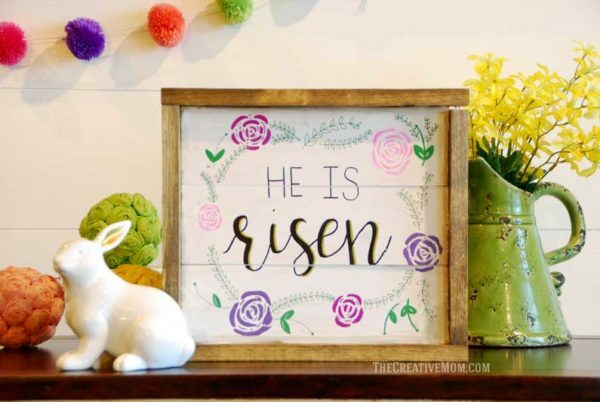 I almost always paint furniture with chalk paint in the house, and with my kids. I feel good about using this chalk paint because it doesn’t have any odor or fumes. And it cleans up SOO well. I cannot tell you how many times I’ve got this paint on my clothes, and I’ve pretty much always been able to wash it off with plain water. Amazing! 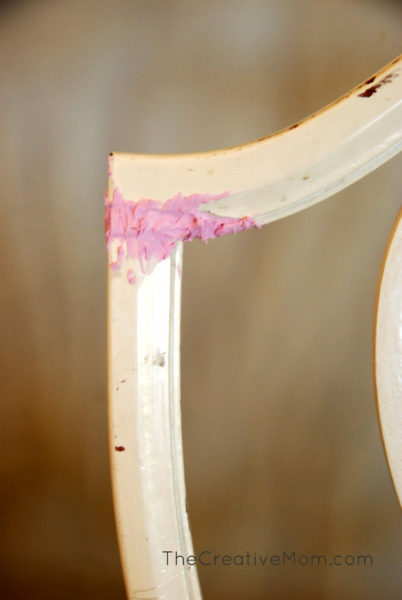 Ok, let’s get into the nitty-gritty of what you NEED to paint furniture with chalk paint. 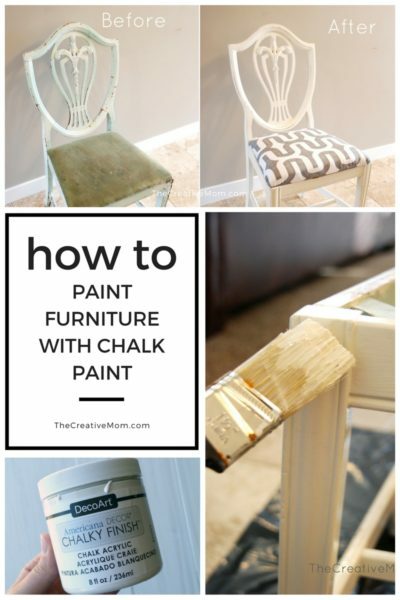 Then we’ll talk about HOW to paint furniture with chalk paint. High quality natural bristle brush. Wax– optional (see above)- if you do use wax, you’ll only need about half as much wax as you need paint. For example, 8 ounces of paint and 4 ounces of wax. Cheesecloth to apply the wax. To paint furniture, you start by prepping. You cannot paint anything if it’s dirty- it doesn’t matter what paint you use, it won’t stick. So get a bucket of warm water with a few drops of dish soap and wash your furniture with a washcloth. Once you’ve wipe off the dust your piece has accumulated from Grandma’s basement, make sure it’s in good shape to paint. If you need to fill holes or replace screws, do that now. If you have any paint chipping off, rub all that you can off. That is all the prep work you have to do. Once your piece is clean and dry, grab a brush start to paint your furniture with the chalk paint! Natural bristle brushes are the best- I really recommend this brush and have used it on a million projects. It washes up good, and it’s totally worth the money to buy a high quality brush. 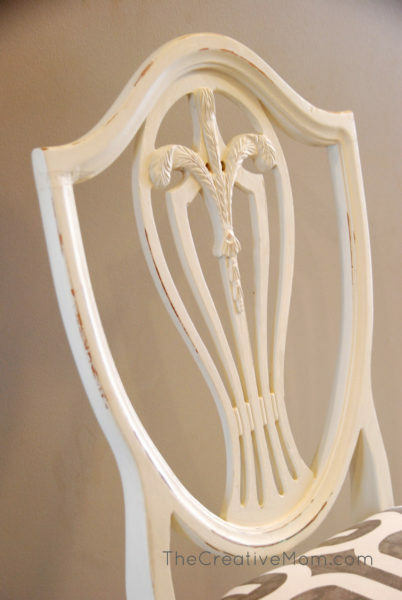 Long, even brush strokes are best way to paint furniture with chalk paint. Use a good amount of paint. 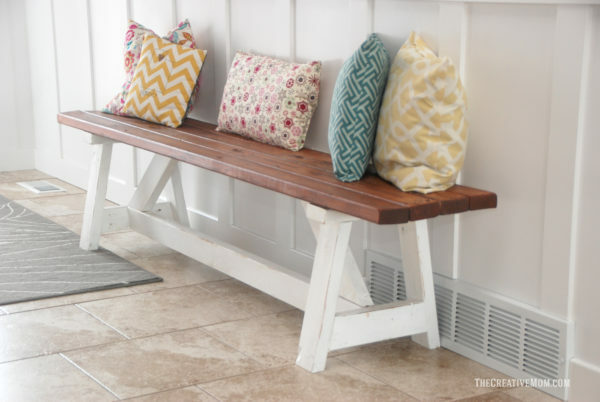 Don’t be afraid to get a good coat of chalk paint on the furniture. 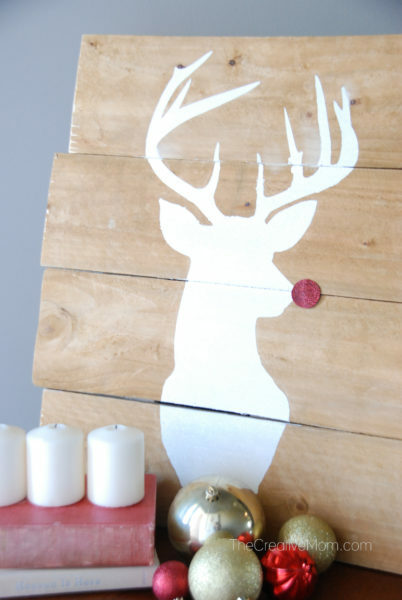 This chalk paint dries fast, so just brush it on quickly and leave it! This is super hard for me because I want to go over every spot like 20 times- but don’t do that! Don’t keep brushing over and over the paint, or else it will get all clumpy and you’ll leave lots of brush strokes. If you want to do more than one coat, let it dry first before applying your second coat. The paint is super thick, as it is designed to make your furniture look hand-painted, not like it came straight from the IKEA factory. So it may show brush strokes, especially if you mess with it a lot. If the paint is too thick for your liking, add a little water, and it won’t show your brush strokes as much. A little water won’t hurt the chalk paint at all. It may be easier to handle if it’s thinned down a little, but you’ll most likely have to do 2 coats. 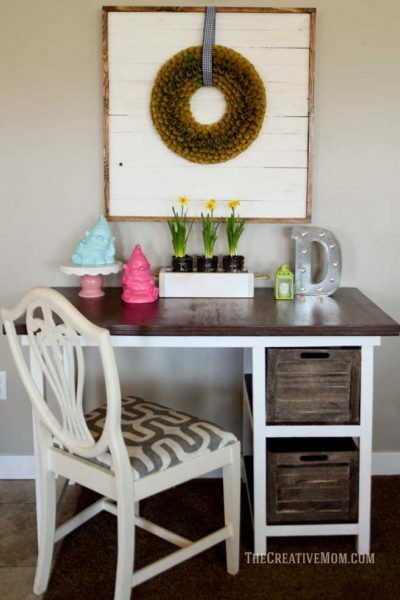 If you’re really worried about brush strokes, try spraying the chalk paint on. I have this paint sprayer designed for at-home use, and I love it! I got it specifically to paint furniture with chalk paint- but only after I’d finished like 20 pieces first, and I wish I had it for my first piece. A paint sprayer is definitely not a necessity, but it’s something nice to have if you’re planning on painting a lot. I think it’s worth every penny- about $50 on Amazon. And the nicest part is absolutely NO brush strokes- but watch those drips! After your first coat dries, apply a second coat if needed. This step is completely optional. 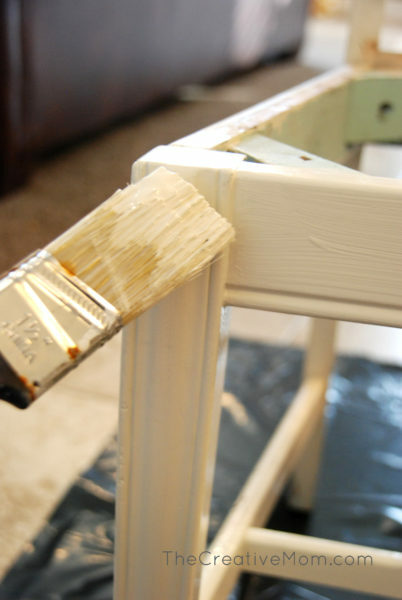 After you paint, you can decide if you want to distress your furniture. I was honestly on the fence with this. 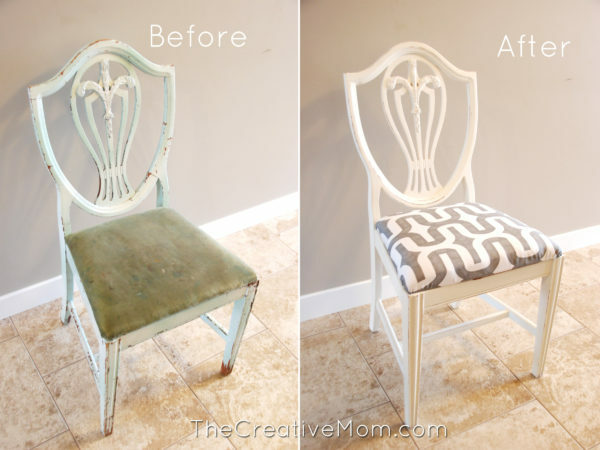 Once it was freshly painted, I didn’t know if I wanted to scuff up my chairs… but I decided to do it, and it really added a lot of character to the chairs. To distress, I used a heavy grit sandpaper (100 grit) to take a bit of paint off here or there. 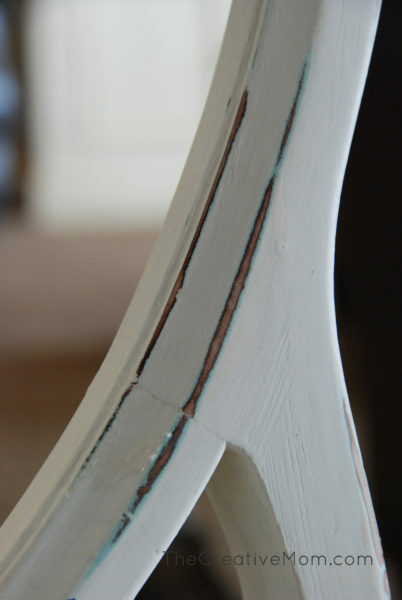 In the photo below, you can see that my chairs had been painted a mint green color before, so when I distressed, that color showed through. I think it added a charming touch. 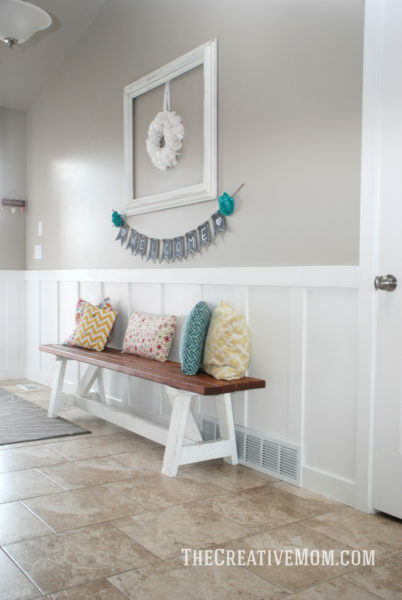 If you like this look, you can paint your furniture with chalk paint in whatever color you’d like to peek through first, before you paint your finishing color. This step is optional, but I really recommend it. It takes a little time, but you’ll be happier with your results. I usually want a super smooth finish on my furniture, so I take a very fine, 400 grit sanding sponge and sand my furniture lightly. Actually, sanding is probably the wrong word here. This technique more like polishes the paint and smooths out any imperfections or brush strokes. You aren’t taking much paint off at all, but rather just knocking down the high, rough spots. If you are planning to do this, two coats would be necessary first. Now I’ve showed you how to paint furniture with chalk paint. You can stop here if you’d like, or you can do the optional finishing step- Waxing. Like I said above, the only time I use the wax is if I know the piece of furniture is going to get a lot of wear and tear and heavy usage. The wax doesn’t hurt anything, but I’m lazy and like to avoid extra steps if I can. 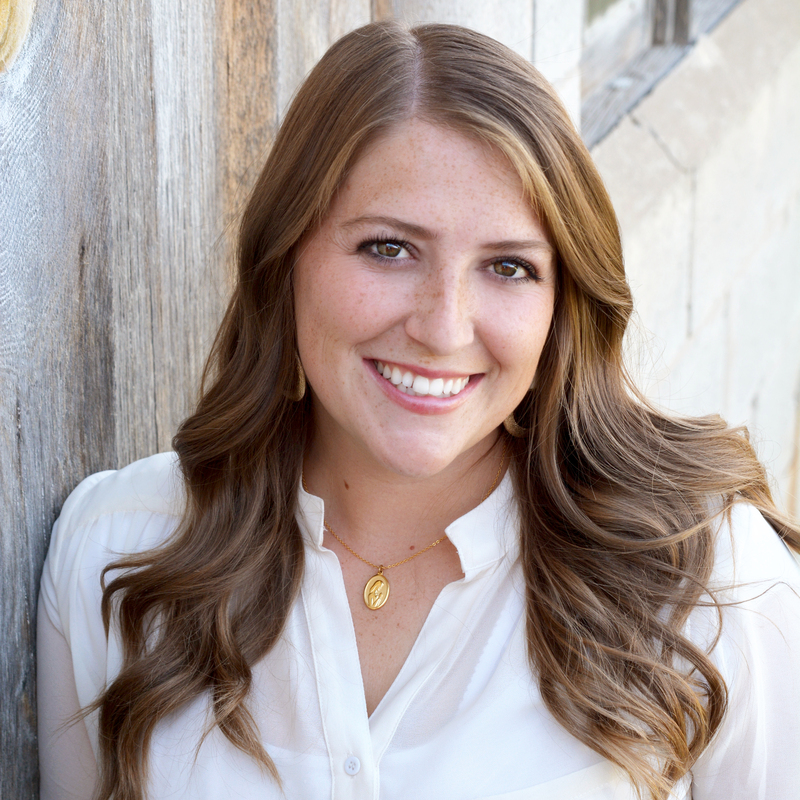 You can always add the wax later if you notice more wear and tear than you’d like. I’ll show you this step just in case you decide to wax. I’m using DecoArt’s Clear Wax. Make sure you have a clean brush. Take your brush and dip it into the wax. The wax reminds me of Crisco. It is soft and kind of creamy looking. You just need a little bit on the end of your brush. It goes a LONG way. Just dab and rub the wax over the entire thing. You want to really rub it into the chalk paint. I’ve heard people say to pretend like it’s hand cream, and kind of massage it into the paint. Then using cheesecloth, rub the excess wax off. The wax shouldn’t feel tacky at all, so if it does keep on buffing. 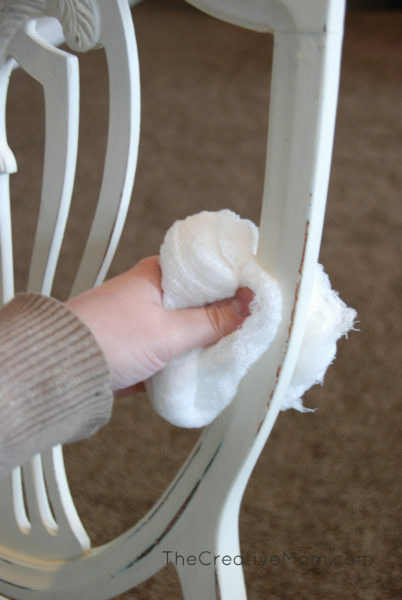 Wait another 24 hours for the wax to harden and you can really buff the chair up with a clean cheesecloth to give it a good shine. That’s all! I know I’ve shared a lot of information on how to paint furniture with chalk paint, but hopefully it didn’t seem too overwhelming. If you have any questions, leave me a comment below and I’ll make sure to answer! Without a doubt, a beautiful furniture always beautifies the home and we always need to take care of them. Painting the old furniture makes them look new and beautiful. This article really helped me a lot as I was looking for such kind of instructions which can help me while painting the furniture of my home. 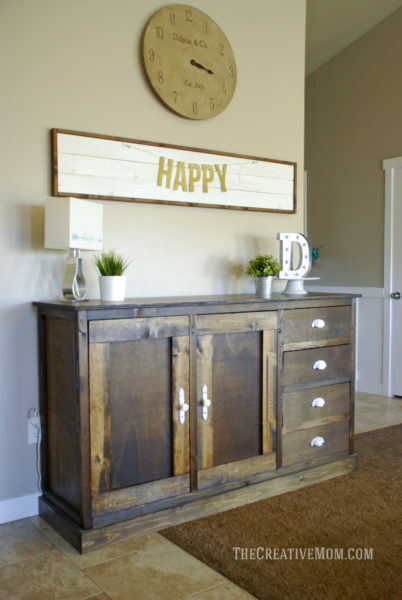 Hey, that’s a wonderful transformation of old furniture into new one. I’m definitely gonna try this for my old cupboard. Thanks. Carpet steam cleaning Melbourne | Carpet steam cleaning in Melbourne. Everything we need to know! Great tutorial, thank you so much. Did you have a stencil for the chair seat ! You did a great job. The chair looks like new. Thank you for the tips, the end result looks amazing! It’s always a big dilemma when it comes to painting furniture, and many people are discouraged because of the mess, the unpleasant smell of the paint, and the fact that it will never look as good as new. But my personal opinion is that with the right paint and some attention we can do miracles.